When most people think of Lowman, they think of the town they drive through on their way from Boise to Banks. But the new owners of the South Fork Lodge have every intention in changing people’s perception of the sleepy mountain town. Chris and Beth Armour purchased the South Fork Lodge in July 2016. Both veterans, Chris served more than 20 years in the Air Force. The new owners got off to a hot start, unfortunately, due to the Pioneer Fire. Luckily, thanks to the hard work of firefighters, the lodge was saved and helped the lodge in more ways than expected. South Fork Lodge is situated on 42 acres, all of which was used to set up the spike camp for hundreds of firemen and other personnel while fighting the Pioneer Fire. Housing all those people and vehicles gave the staff of South Fork the practice and confidence they needed for hosting future events and bringing large crowds to the small mountain town. “The main reason we love Lowman is because it’s so easy to get to. You can hop on the motorcycle after work, have a bite and a cold one, ride back and be home before sundown,” says Armour. There are nine inn rooms, priced at an average of $130 a night, each facing the south fork of the Payette River for quick access to drown a few worms. Three private cabins are available which offer beautiful views of the surrounding mountains and glimpses of an occasional elk bugling in the meadow nearby, which will cost you about $170 a night. We retreat to the mountains to disconnect from technology and reconnect with nature, and the rooms and cabins at South Fork Lodge have no telephones or televisions. But rest assured, your millennial children will be able to upload their next Instagram worthy photo in the main lodge where Wi-Fi is available. Walking the picturesque property, a girl can’t help but imagine having her “big day” at a place like this. The 5,000-square-foot barn is being renovated with hopes of hosting weddings and corporate retreats. South Fork Lodge also offers a massive guest house perfect for relaxing before and after you say “I do.” The rooms are available individually or as a whole package. Rooms are offered on the upper and lower floors, perfect for keeping the groom from sneaking a peek at his bride. For those who are just passing through Lowman, you may want to reconsider. Even if you only have time for a quick lunch and stretching of the legs, you can’t go wrong with the food at South Fork Lodge. “The potato salad is a secret family recipe and is great with our burgers served on our South Fork pretzel buns along with a great selection of craft beer on tap,” Mosher says. The dining room is the definition of rustic luxury with beautiful wooden tables overlooking the meadow while a fire roars in the fireplace, adorned with a massive antler shed chandelier overhead. The patio is dog friendly and is located next to the Payette River with big screens for watching the game and fire pits to keep warm. “There’s beautiful stargazing near the fire pit which is perfect with a bucket of beer from the bar,” Mosher says with a smile on his face, looking relaxed already. The kind folks at South Fork Lodge are wanting to change Lowman’s image and make South Fork Lodge more than just a place to stay. Plans include destination vacation itineraries including a base camp for explorations such as snowshoeing, snowmobiling, fishing, soaking in nearby hot springs, tour groups, river rafting, and more. One can’t help but admire the blood, sweat, and tears they have put into remodeling the lodge. The lodge has been in Lowman since 1937 and has endured being burned down, rebuilt, closing from 2009 until 2016, a changing of ownership, and most recently, a thorough facelift by the Armours. You can feel the passion they have for the lodge and for the town the very moment you walk in the front door and see the hosts’ smiling faces. Lowman is so much more than just a drive through town. It’s a place to slow down for a bit, listen to the silence of the mountains, throw in a fishing line with a cold one, and star gaze under an unspoiled night sky. 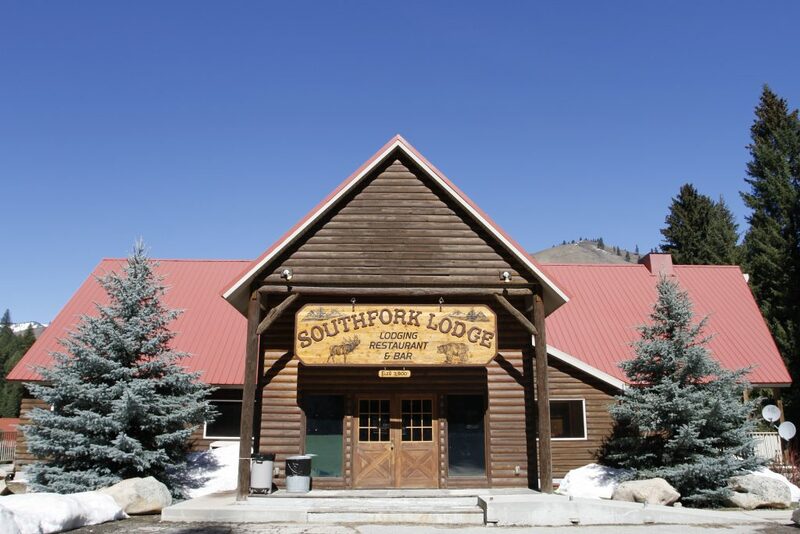 The folks at South Fork Lodge would be happy to show you around.